I'm a social account executive at DNN Corp. I help companies build online communities directly within their website. When I’m not helping clients increase user engagement with our online community solution (Evoq Social), I’m out on the golf course trying to break ninety. From the equipment, to the beautiful courses, I love everything about the sport. But the thing I enjoy the most is the golfing community. I decided to use Evoq Social to build an online community for golfers (GolfersCa.com). Proud of my work, I shared my site with friends and family and asked them to sign up as members. Photo source: MarineCorps NewYork on flickr. And though I enjoyed my mother’s (a non-golfer) posts about Tiger Woods, I knew GolfersCA was not a true online community until I had truly engaged community members. So I had my online community up and running. I picked up DNN's Online Community Playbook and developed the following plan to increase members and engagement. Every community has one and most successful communities have more than one. We all know them: they tend to flood our newsfeed and are first to comment on photos. These community evangelists supply the content on websites. I knew I needed them, but where and how would I recruit them? My college job was selling golf clubs during the weekend. I was able to meet and network with many golf pros, caddies, golf instructors and greenskeepers. I’ve kept in touch with most of them, just in case I ever needed a free round, or in this case, more members in my online community! I invited my golf network to become not only community members, but community experts as well. With Evoq Social’s gamification features, I was able to reward them extra points and give them exclusive “Golf Pro” badges. They were my new community evangelists. Pictured: Meet Megan and Carl, two of the community evangelists on the site. They knew that their contributions are not only beneficial for the community, but for their own personal branding (in the golf industry) as well. I encouraged them to blog, answer questions, and post discussion topics. Though my community evangelists are my personal friends, they are passionate about golf. Your's may be employees or clients. You may not even personally know your community evangelists. What's important is that they are passionate about your product or cause. Once I recruited my community evangelists, the second step came easy. My goal was to have them generate the content for my site and reduce my workload. The only problem was, what content would they write? I wanted to create a community for all types of golfers. I needed to tailor my content to the community members I hoped to attract. Photo source: Dan Perry on flickr. 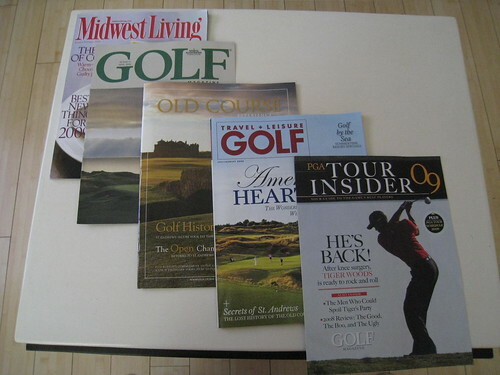 For example, if I was a new golfer, what would I want to read? Maybe a blog post on the fundamentals of the golf swing? Or a discussion topic on the best golf equipment for beginners? I strategized my content topics based on what my audience would like . But most importantly, I needed to identify the topics that would keep them engaged and incent them to participate. After I came up with content ideas, I took them to my community evangelists. Their Golf Pro badges were well deserved as they posted blogs, answered questions and started discussions. I encouraged them to end all posts with an open-ended question , asking the reader their thoughts, ideas and feelings on the topic. Why? To invite other members to join the conversation. Every community manager dreams that one day, user-generated content floods their community. That would be ideal, but in a new community, you need to do a little extra to fuel the flames (so to speak). When creating content, remember to always ask yourself, what content would my community members want to read? Or better yet, what content would make them participate? The best way to recruit members is to find communities in the real world. Where is the best place to recruit golfers? Where else but a golf course! Hosting an event or attending a meet-up is a great way to meet and recruit members. I joined local golf groups, and attended meet-ups where I met golfers and introduced them to my online community. Along with joining meet-ups, I reached out to local golf courses. I partnered with Deep Cliff Golf Course in Cupertino, California. Photo source: Francesco Crippa on flickr. I shared their golf tournament on my site, and plan to work with them and other golf courses to promote GolfersCA. People join organizations they believe in and trust. This is especially important if you’re running an online community that requires your members to share their personal information. By hosting golf events and tournaments, I will build my community’s credibility among golfers. These meet-ups and events will not only increase member registrations, but also build bonds among community members. If you build it, will they come? Not really. My community was empty and lifeless for four months after its launch date. With Evoq Social, building my online community was the easy part. Figuring out how to grow the community was hard.It's important to spend time figuring out your community growth strategy. I hope these tips I've shared have given you a framework for the first steps in starting your own online community.